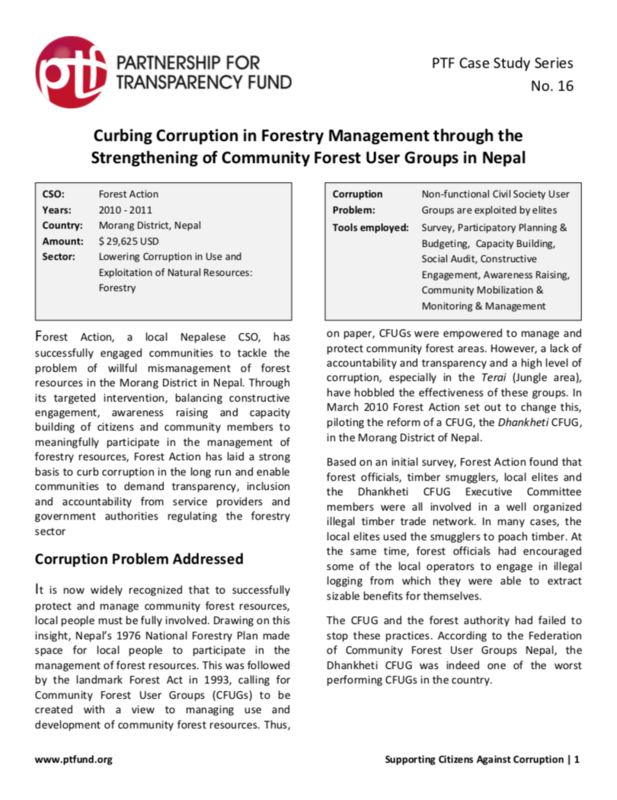 This report reviews social accountability work of 19 CSOs working in many VDCs (Village Development Committees) in 25 very different Municipalities and Districts of Nepal, using 15 different kinds of social accountability mechanisms in three themes. 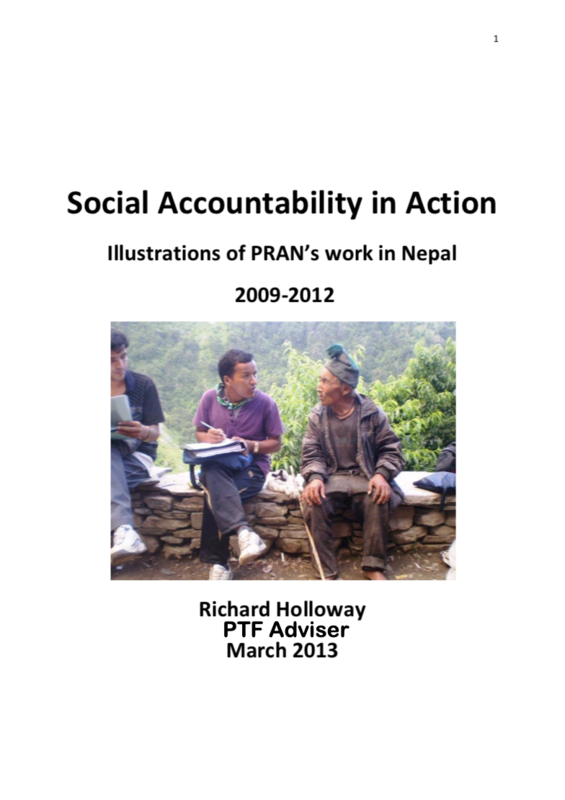 The report is intended to stimulate thought about how social accountability works in practice and how the demonstration work of PRAN can be replicated and expanded to achieve the overall impact desired. 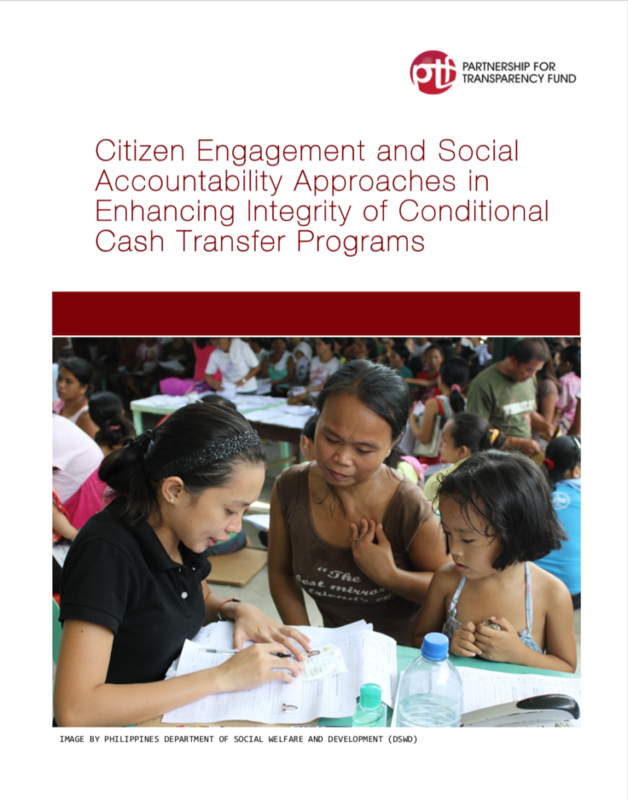 Guarding the Integrity of the Conditional Cash Transfer Program (CCT) for the Philippines (i-Pantawid) aims to develop a model for civil society—government partnership for transparent and accountable implementation of the Patanwid Pamiliyang Pilipino Program. 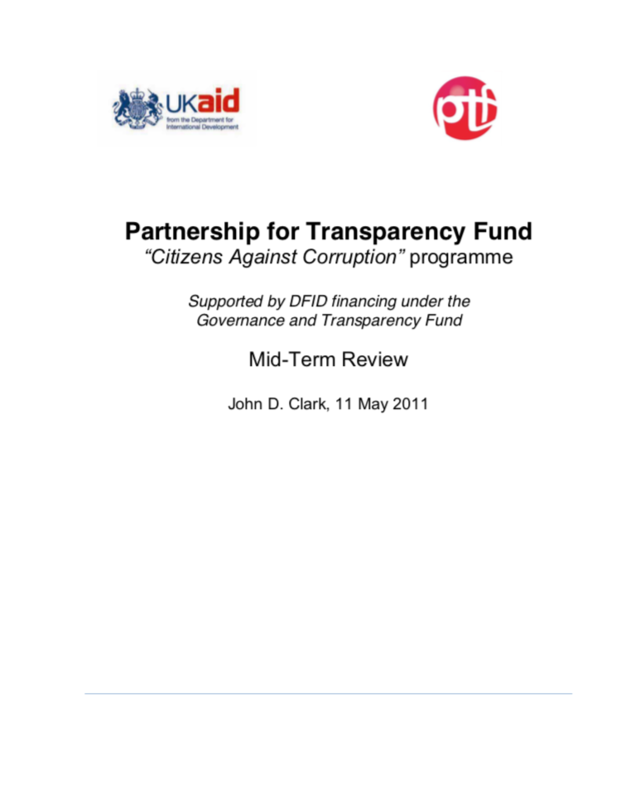 Over the last dozen years The Partnership for Transparency Fund has supported with money and expert advice more than 250 projects across the developing world to reduce corruption. 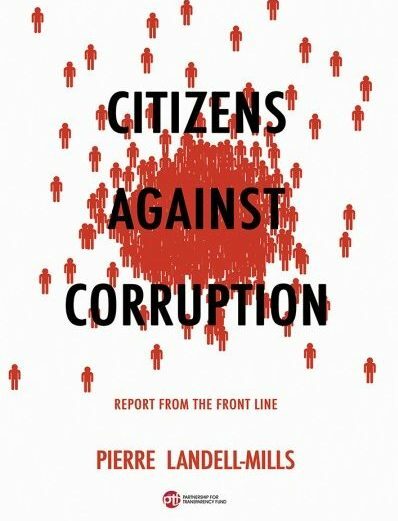 Now, in a brand new book, Landell-Mills reviews the record: he highlights the civil society organizations that are making a real difference to secure basic human and civil rights for tens of thousands of poor people; he describes fascinating projects in Asia, Africa, Latin America and in Central & eastern Europe; and, he brings to the fore the key lessons that all engaged in the fight against corruption need to use to advance their work. 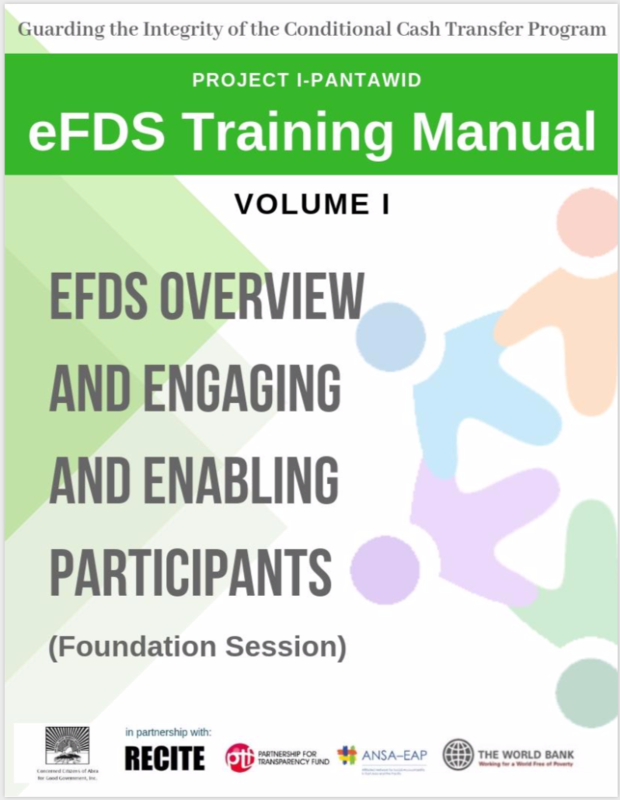 The 2030 Agenda for Sustainable Development commits all 193 UN Member States to achieving 17 Sustainable Development Goals (SDGs) through collective efforts between governments, the private sector and civil society. 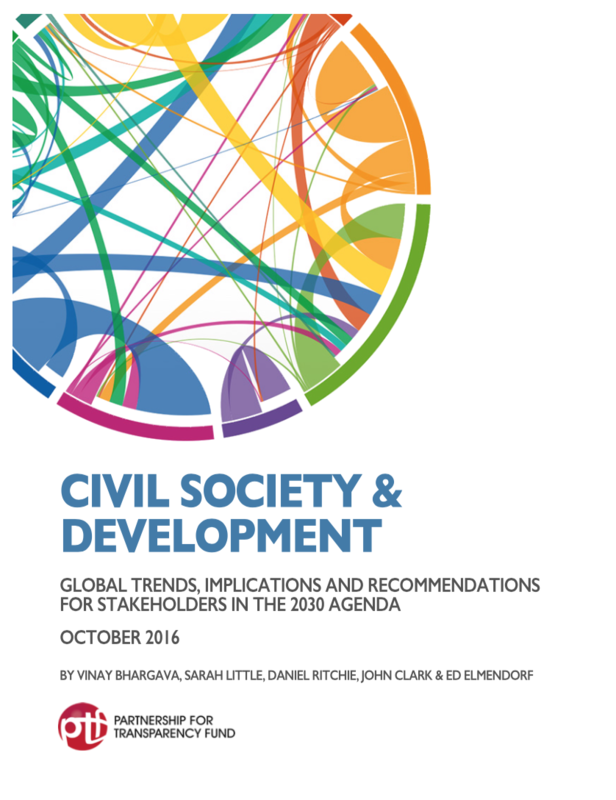 The 2030 Declaration specifies roles and responsibilities for civil society to play but is ambiguous on how partnership structures would be forged at the national level. 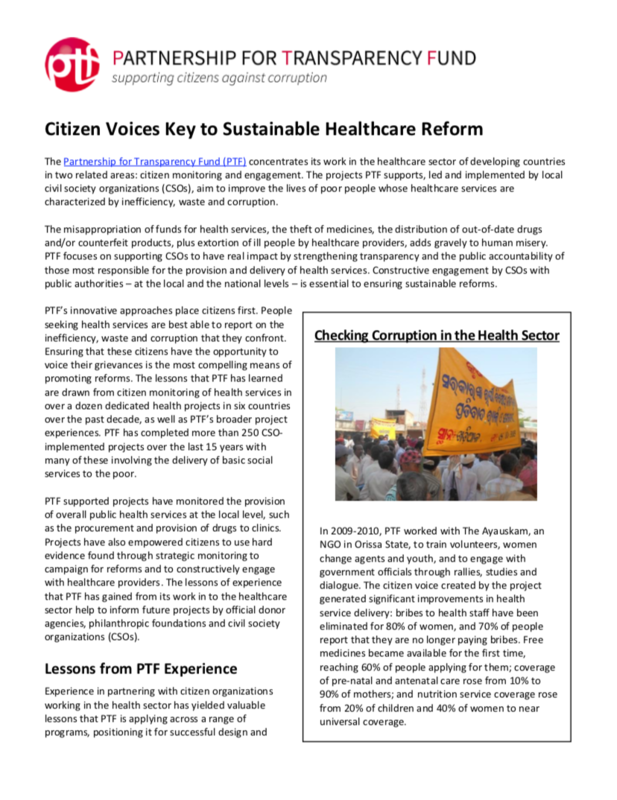 A team of PTF experts have analyzed several global trends concerning civil society’s role in development and their implications for various stakeholders to build a better understanding of modalities for CSO engagement. 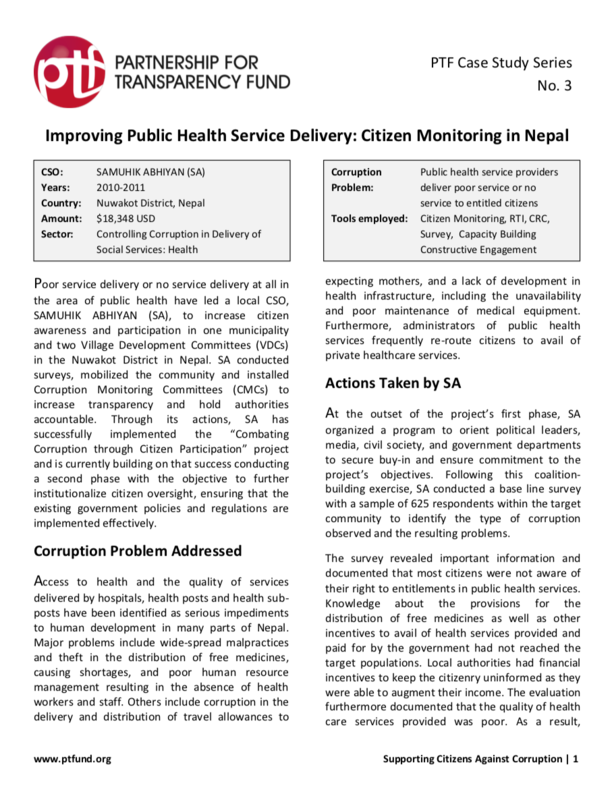 Recent years have witnessed concerns about issues of government effectiveness and accountability, particularly in the delivery of public services. 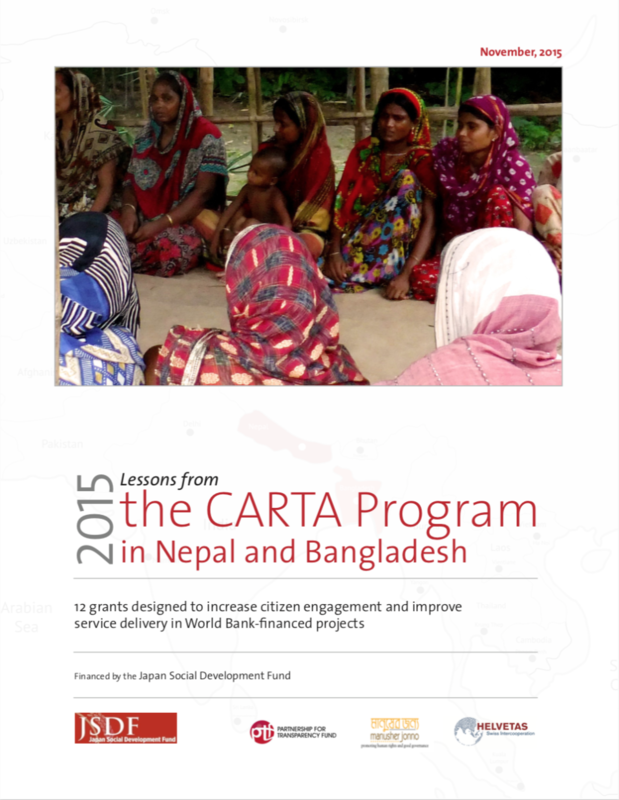 Citizen engagement is increasingly recognized as a method to help improve development program effectiveness. 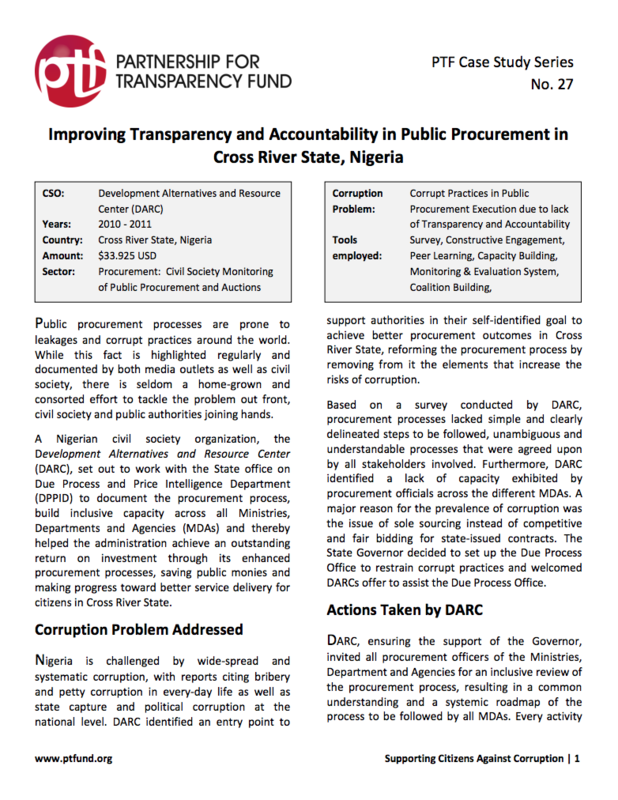 This report reviews the unique initiative to enhance World Bank projects by promoting CSO engagement to demand better governance and offer recommendations for future accountability programming. 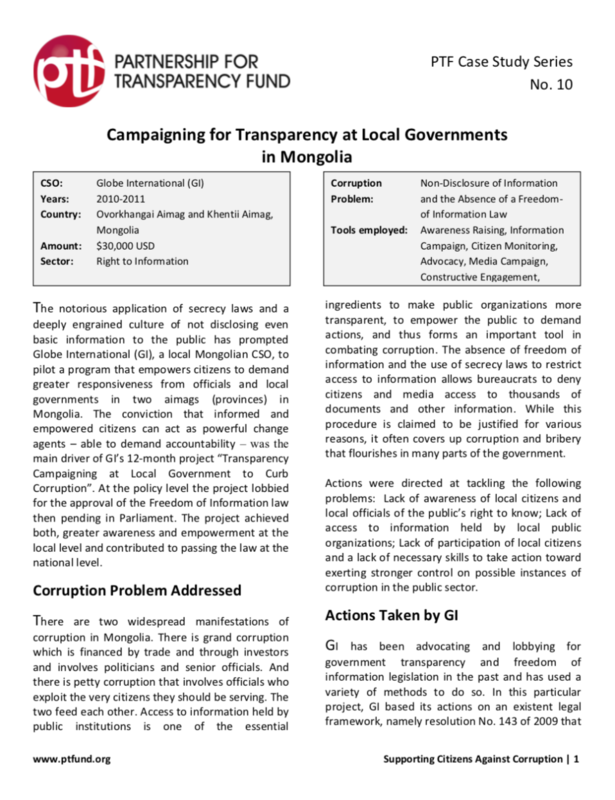 This paper is a modest contribution to a main focus of the upcoming 2015 Open Government Partnership (OGP) Global Summit: How principles of open government can support compliance with the Sustainable Development Goals of the United Nations Post-2015 Agenda. 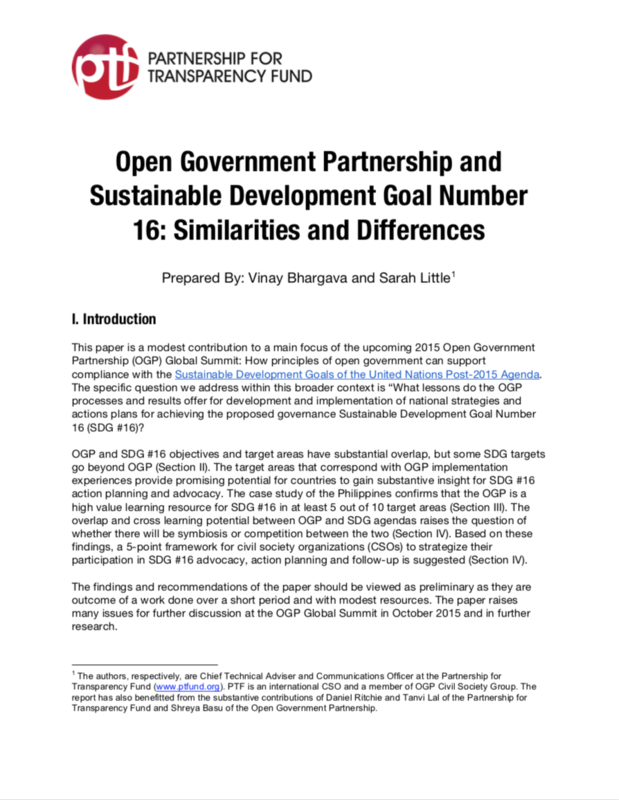 The specific question we address within this broader context is “What lessons do the OGP processes and results offer for development and implementation of national strategies and actions plans for achieving the proposed governance Sustainable Development Goal Number 16 (SDG #16)? 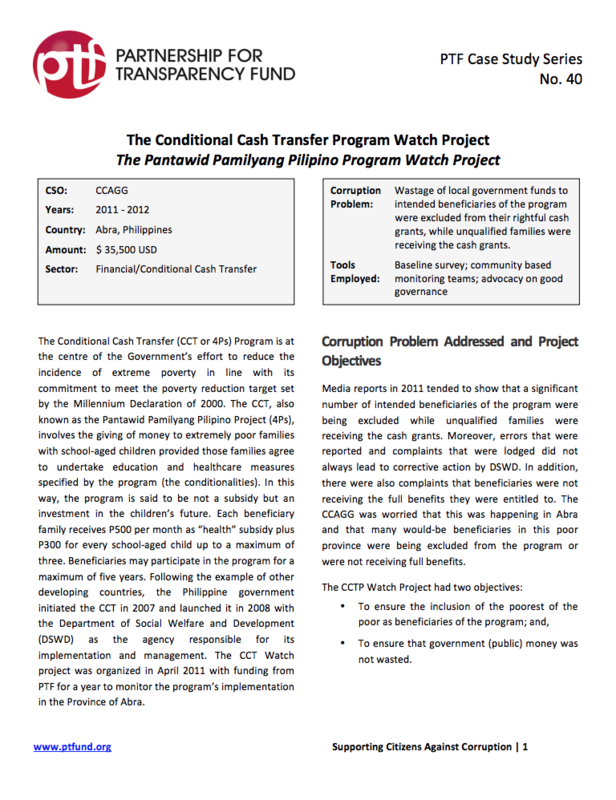 Conditional cash transfer programs (CCTPs) are widely used in the world and are proving effective in generating proven poverty alleviation impacts. 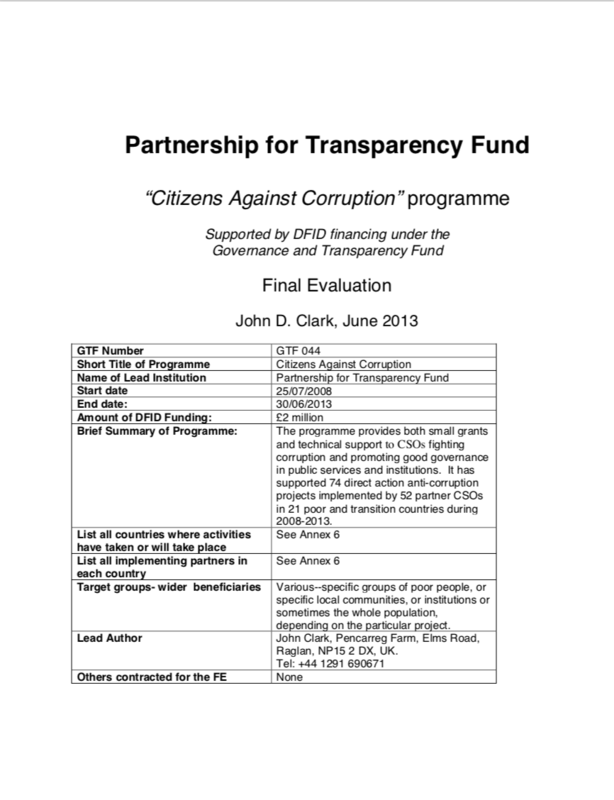 However, CCTP achievements are undermined by fraud, errors, and corruption. 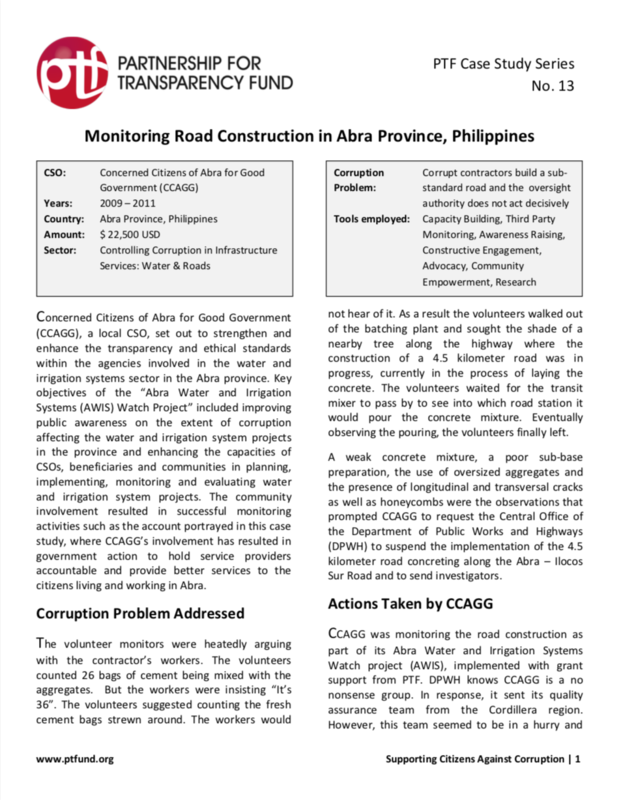 These integrity risks and international experiences in managing them by using both state and civil society-led efforts have been analyzed in a paper prepared by PTF as part of Guarding the Integrity of the Conditional Cash Transfer Program (CCTP) in the Philippines, implemented by the Concerned Citizens of Abra for Good Government (CCAGG) and funded by the Global Partnership for Social Accountability (GPSA). 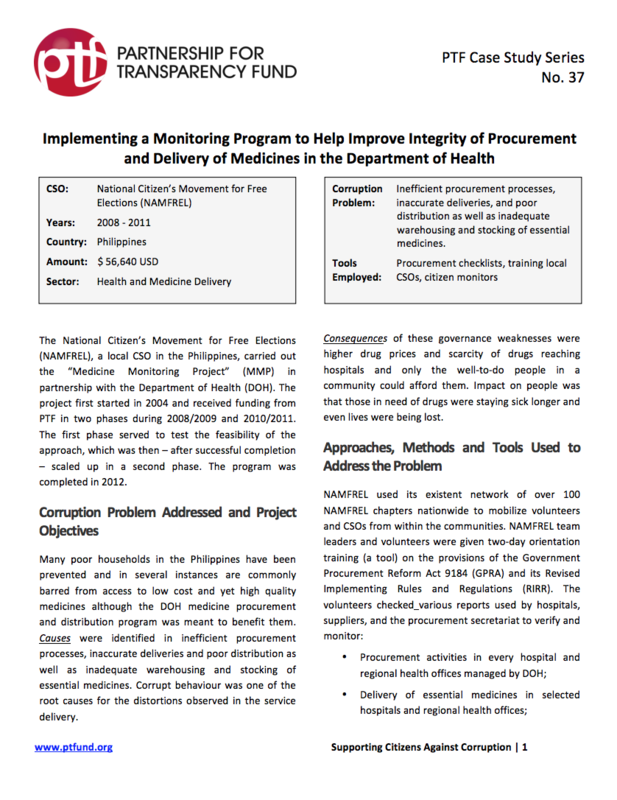 This report summarizes the current findings on citizen engagement instruments and examines whether these interventions have contributed to enhanced health practices and ultimately on improved health outcomes. 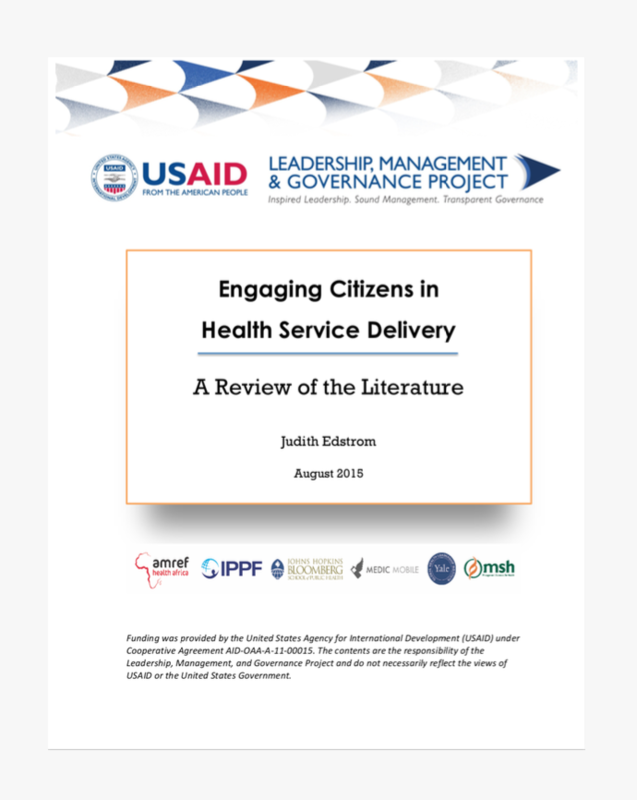 The publication was produced by PTF Adviser, Judith Edstrom, under USAID’s Leadership, Management, and Governance Project, a USAID-funded program to collaborate with health leaders and policy makers being Implemented by a consortium led by Management Sciences for Health (MSH). 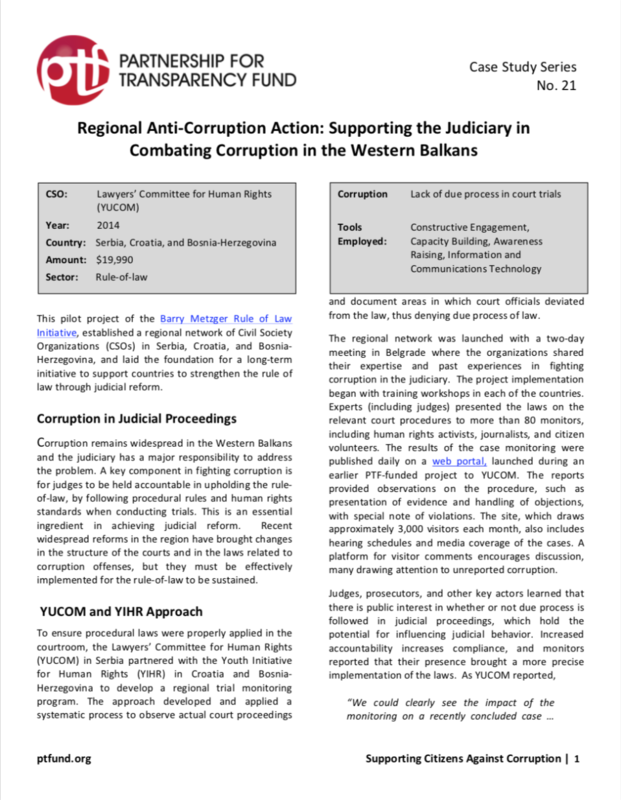 This pilot project of the Barry Metzger Rule of Law Initiative established a regional network of Civil Society Organizations (CSOs) in Serbia, Croatia, and Bosnia-Herzegovina, and laid the foundation for a long-term initiative to support countries to strengthen the rule of law through judicial reform. 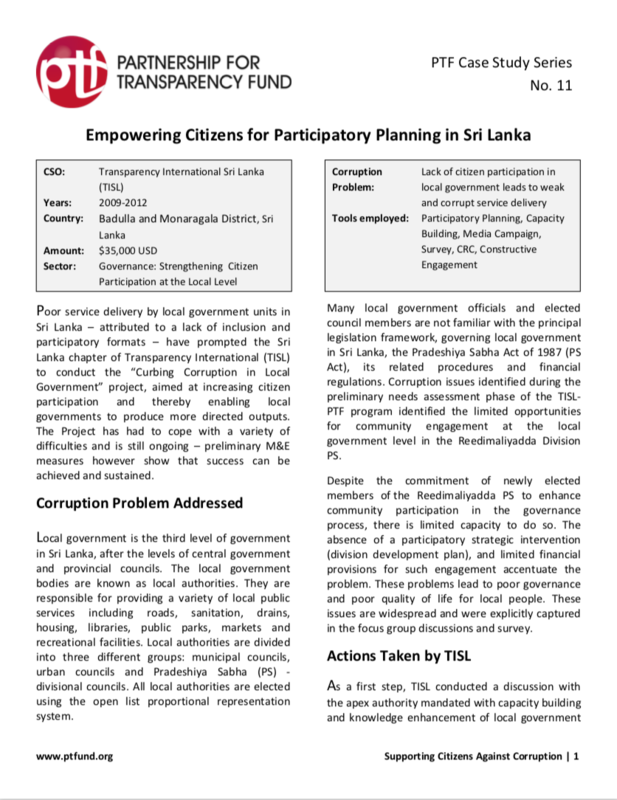 Citizens’ and communities’ inadequate knowledge about entitlements guaranteed through the government administered National Rural Employment Guarantee Act have prompted a local CBO, the Nava Jeevana Mahila Okkoota (NJMO), to engage with affected communities, raise awareness, provide education and help capacitate and organize the communities to form sustainable labor groups. 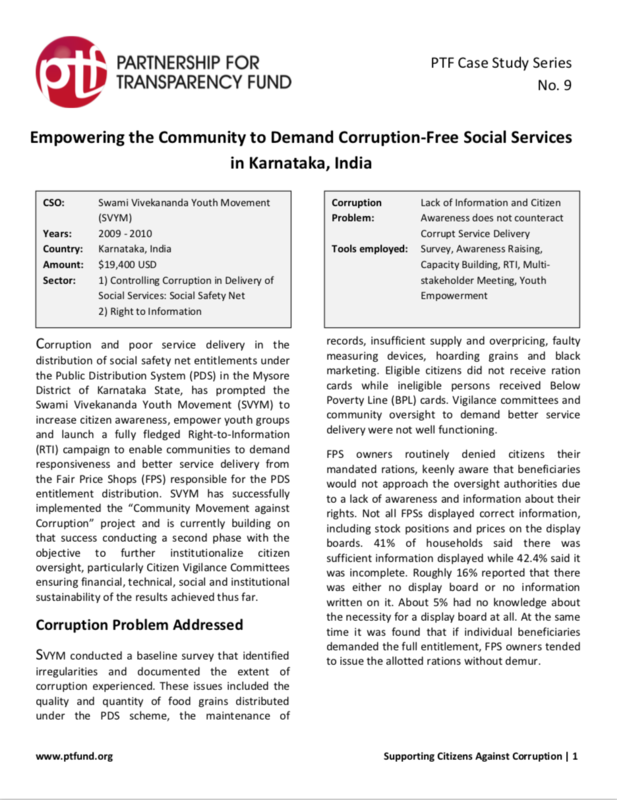 The objective is to hold the government and service providers accountable while helping citizens benefit from the programs precisely designed to help India’s rural poor. 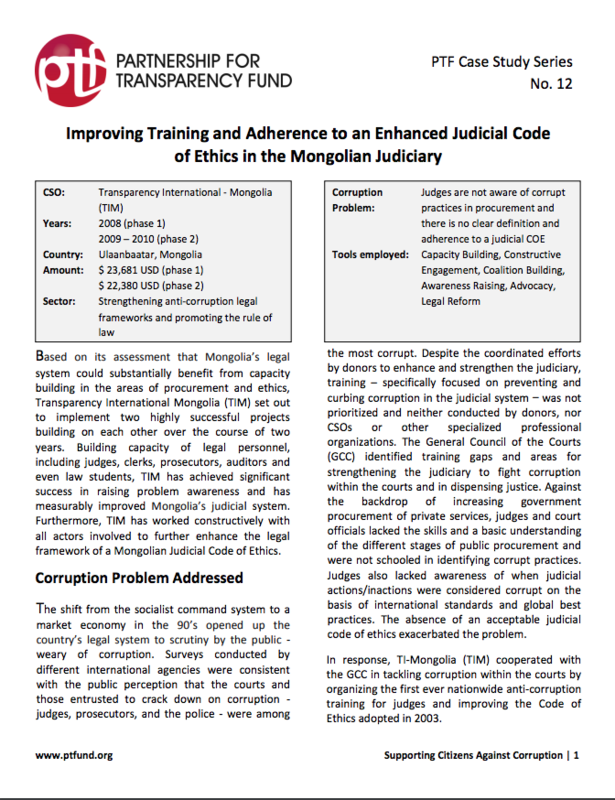 NJMO has successfully established a model that has the potential to be self-perpetuating in the long run, forming labor groups that can transform into member-financed independent unions afterwards. 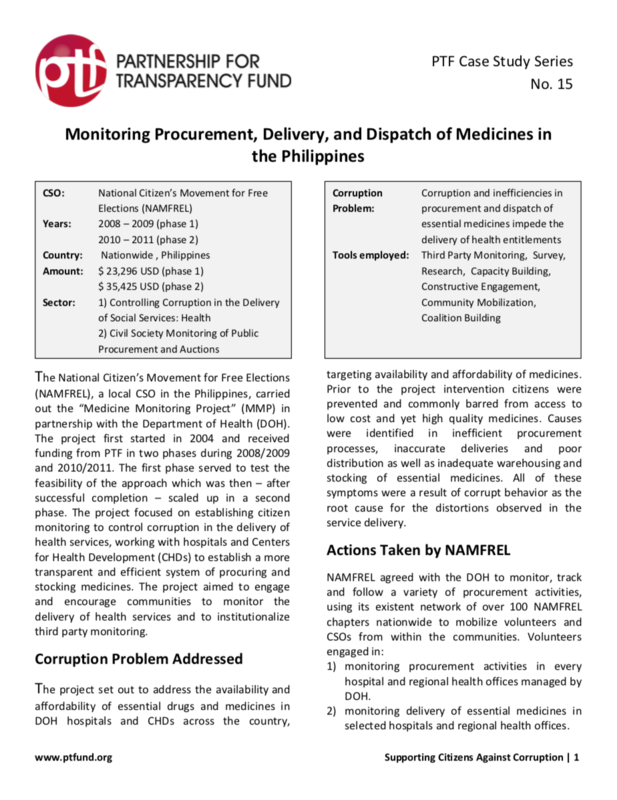 The project has been successfully implemented and a second phase is currently underway. 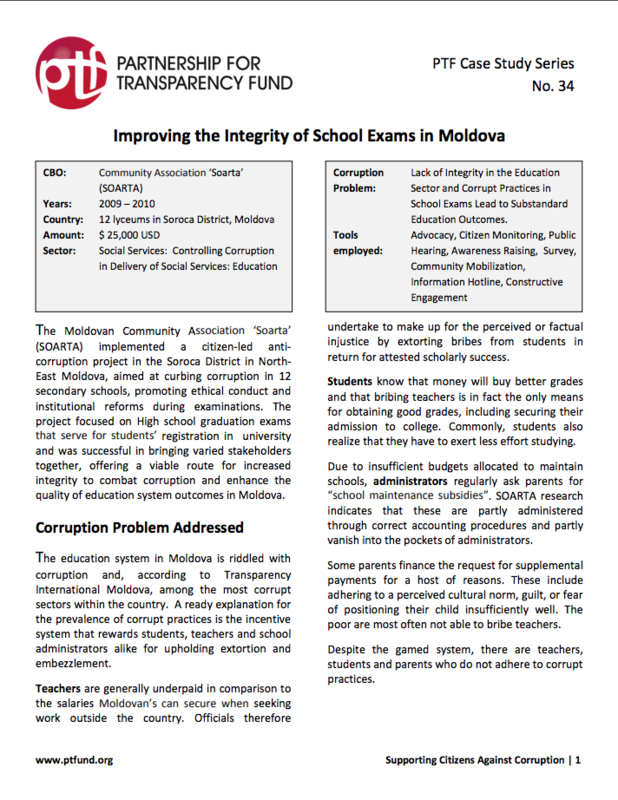 The Moldovan Community Association ‘Soarta’ (SOARTA) implemented a citizen-led anticorruption project in the Soroca District in NorthEast Moldova, aimed at curbing corruption in 12 secondary schools, promoting ethical conduct and institutional reforms during examinations. 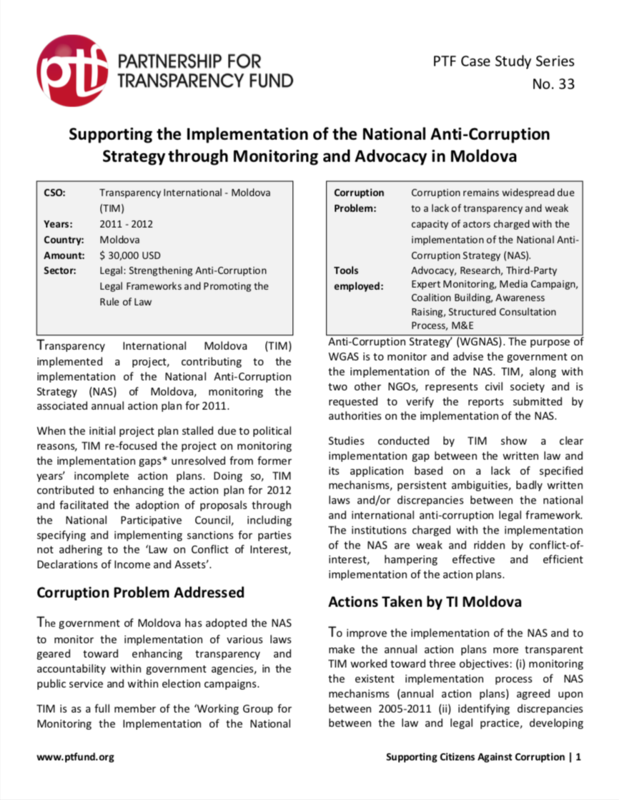 The project focused on High school graduation exams that serve for students’ registration in university and was successful in bringing varied stakeholders together, offering a viable route for increased integrity to combat corruption and enhance the quality of education system outcomes in Moldova. 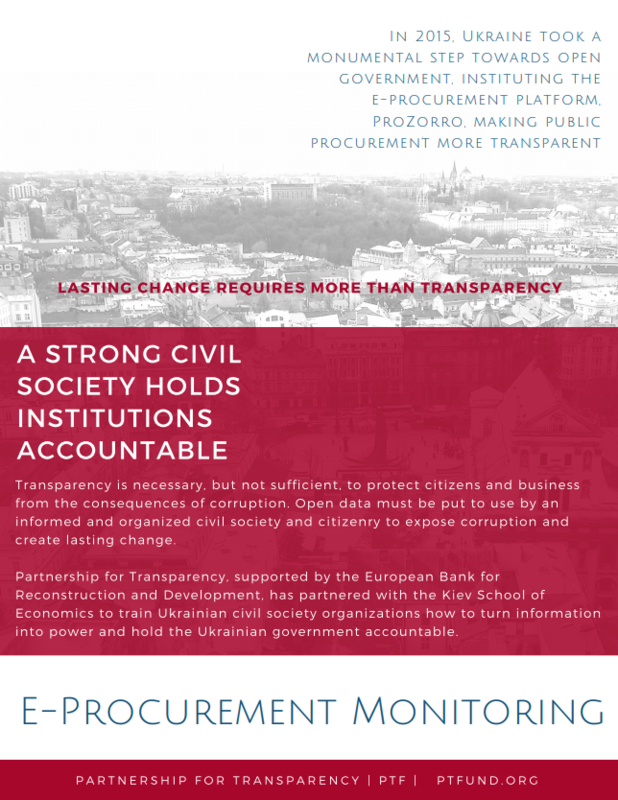 Public procurement processes are prone to leakages and corrupt practices around the world. 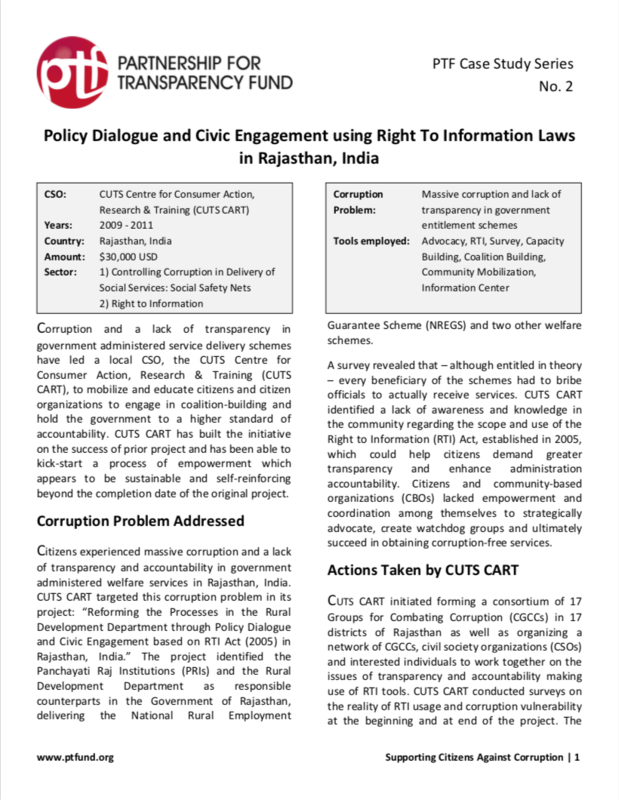 While this fact is highlighted regularly and documented by both media outlets as well as civil society, there is seldom a home-grown and consorted effort to tackle the problem out front, civil society and public authorities joining hands. 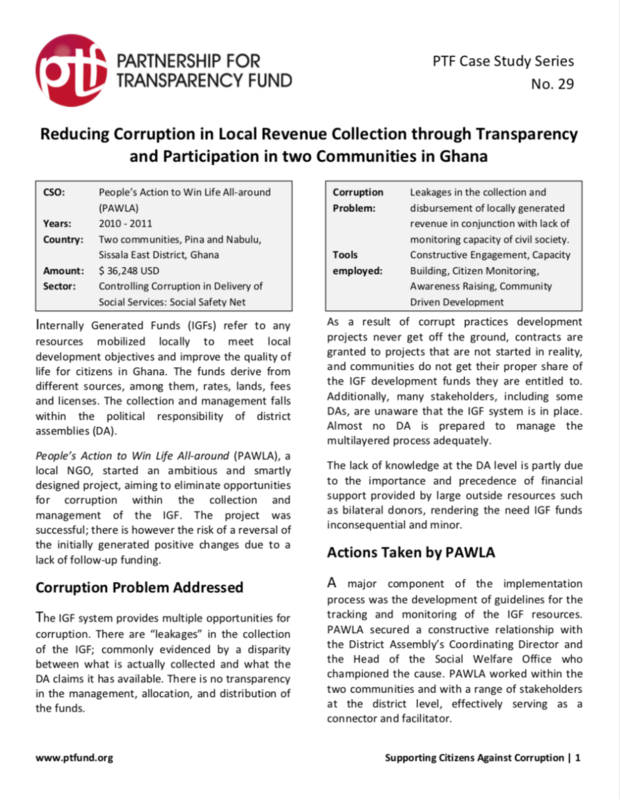 Internally Generated Funds (IGFs) refer to any resources mobilized locally to meet local development objectives and improve the quality of life for citizens in Ghana. 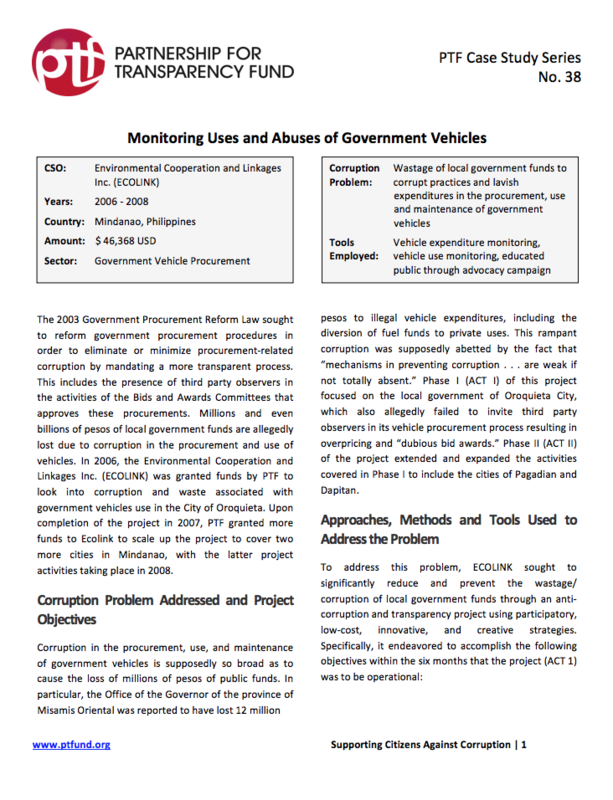 The funds derive from different sources, among them, rates, lands, fees and licenses. 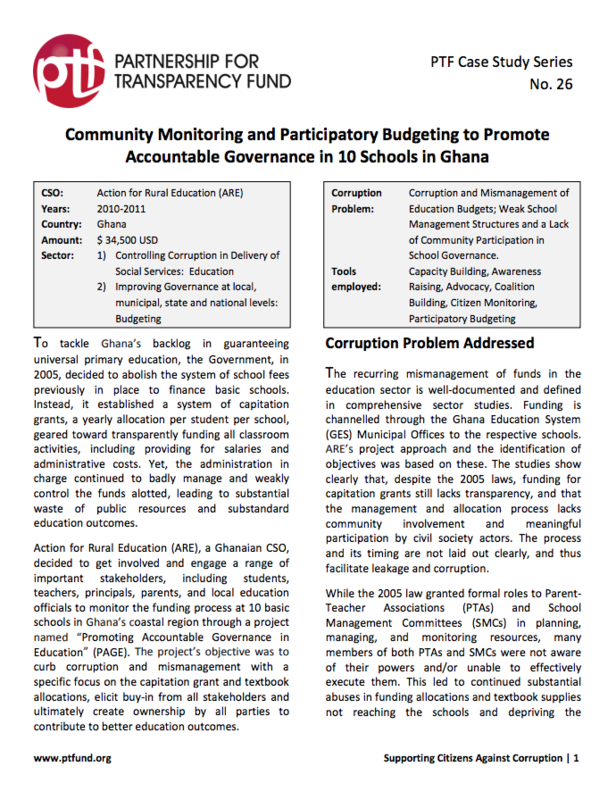 The collection and management falls within the political responsibility of district assemblies (DA). 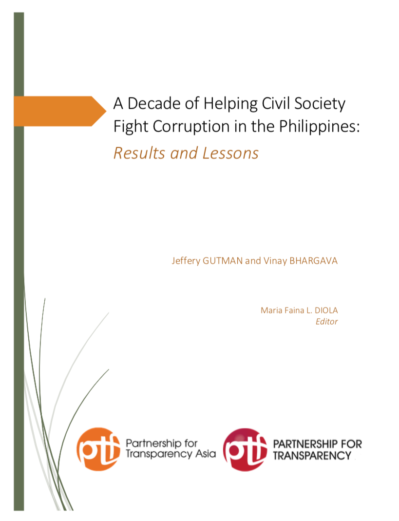 This report details the results and lessons of a decade long (2003-2013) Partnership for Transparency Fund (PTF) support to Filipino civil society organizations (CSOs) to fight corruption. 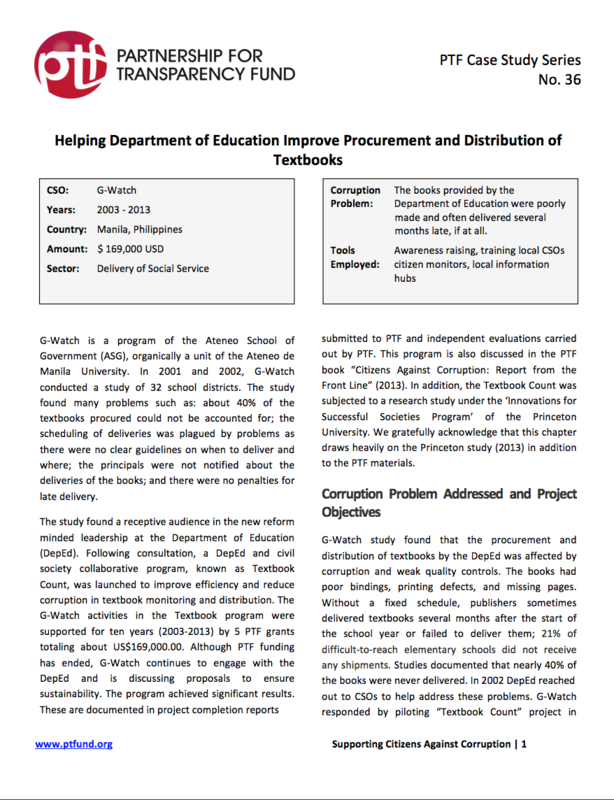 It celebrates the successes and reflects on challenges faced as PTF enters a new phase in the Philippines – a regional affiliate called PTF Asia as a foundation headquartered in Manila. 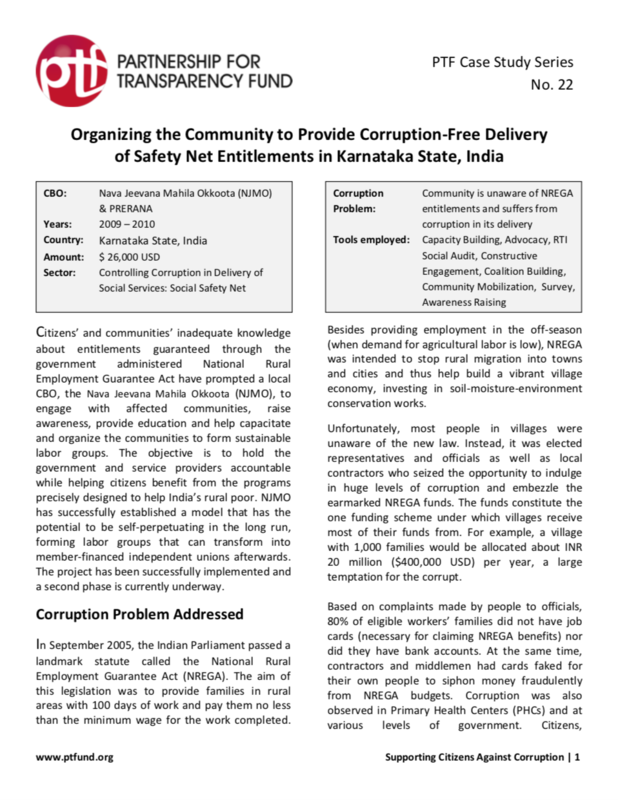 Many governments support publically-funded rural works programs to provide safety nets for the rural poor and to deploy the underused labor productively. 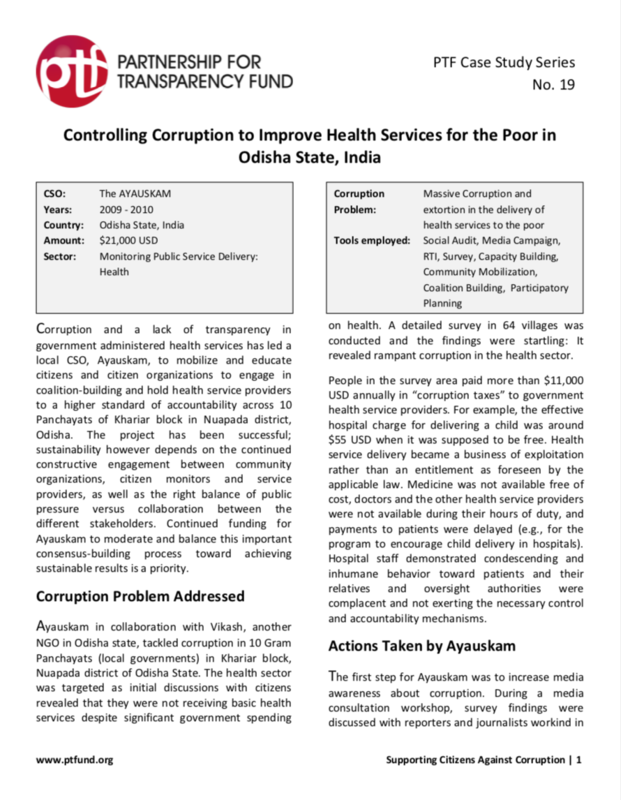 It is estimated that developing countries spend over 10 billion dollars a year on such programs aiming to benefit over 100 million poor. 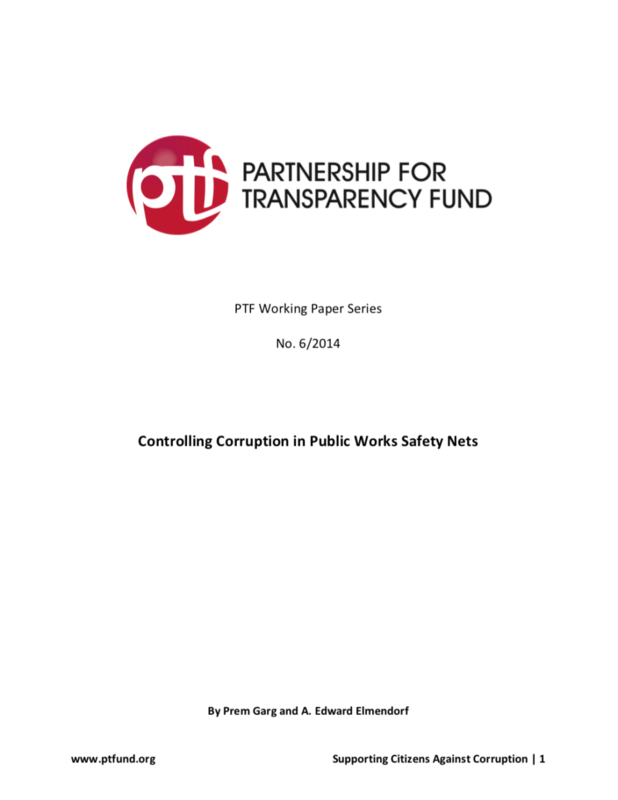 Because of their decentralized nature with activities scattered over thousands of often remote work sites and with most potential beneficiaries not used to dealing with government bureaucracies, fraud and corruption are often a major risk in such programs. 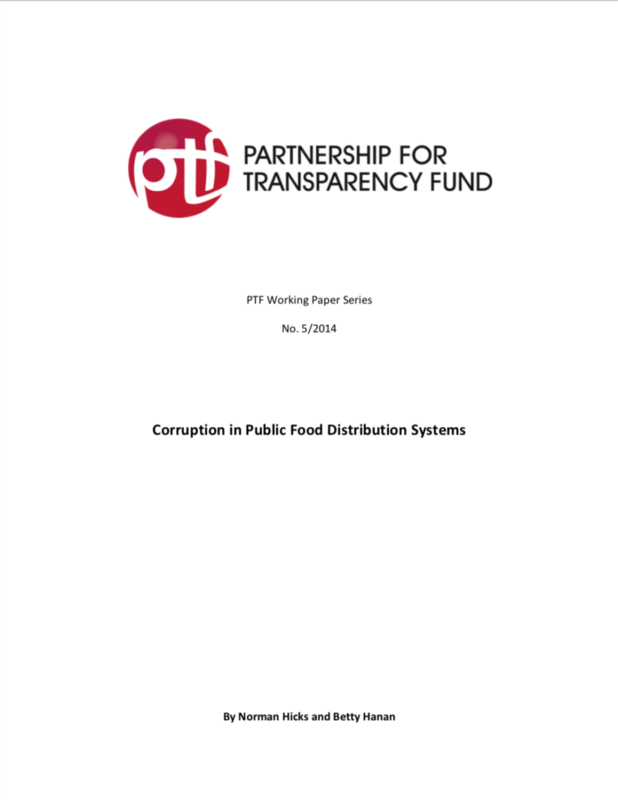 Since 2009, PTF has financed eight projects with grants totaling $202,000, for projects operated by 4 CSOs in India designed to reduce corruption in PDS (Public Food Distribution Systems). 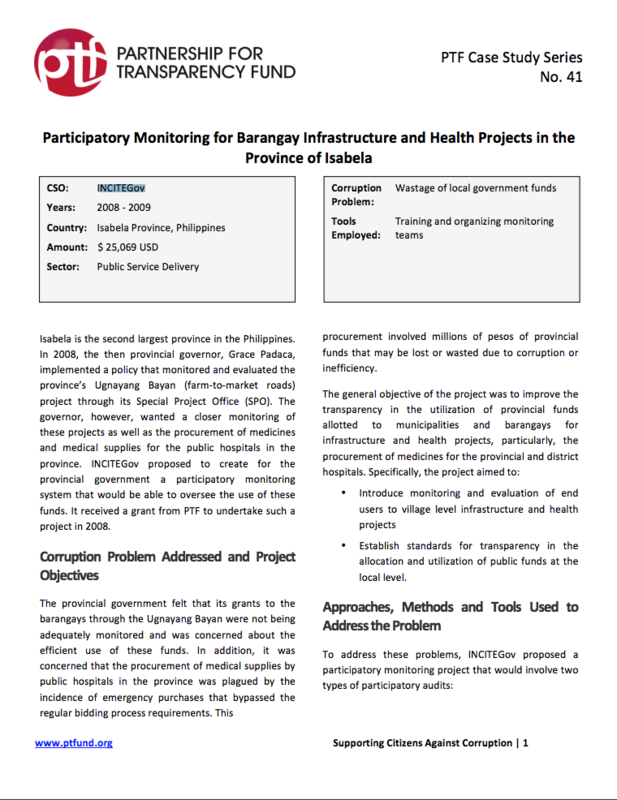 A number of lessons learned from these projects are drawn out and recommendations for future action are provided. 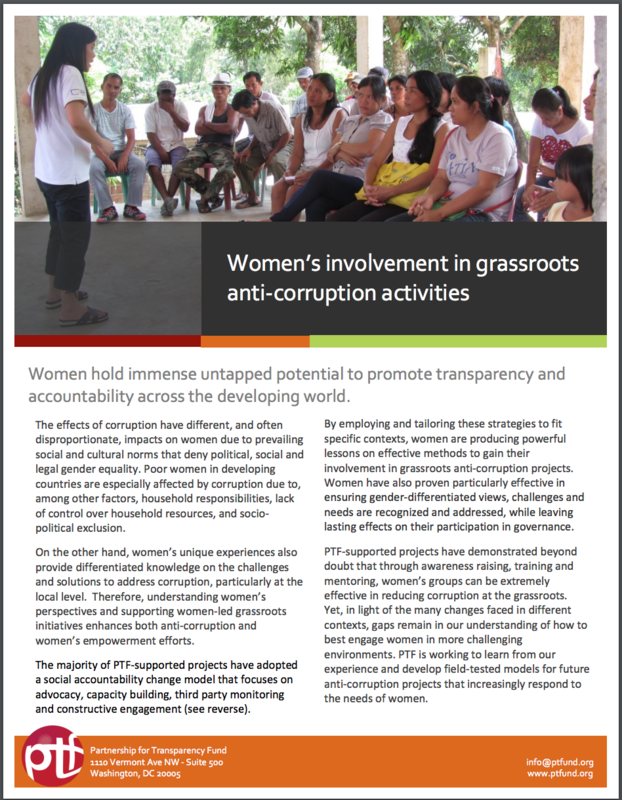 This report provides expert advice, case studies and presentations that will help CSOs around the world reach greater impact through their work. 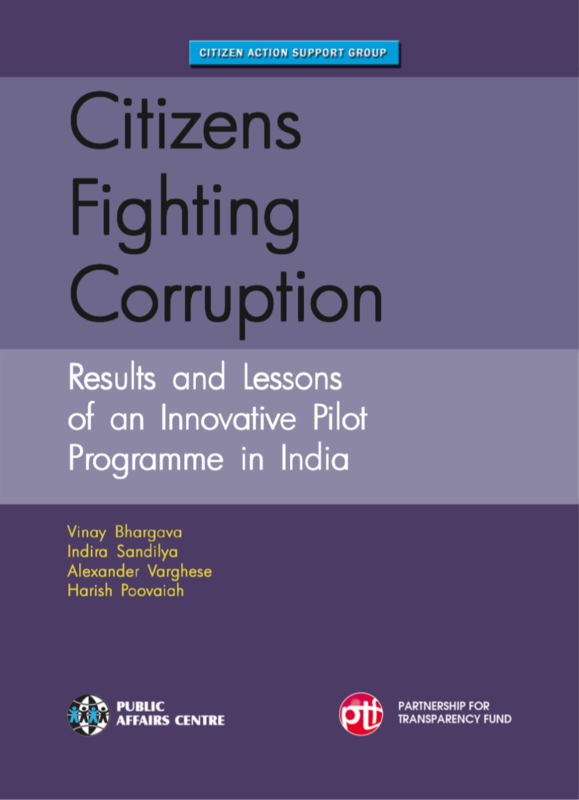 It identified ‘constructive engagement with authorities’, ‘innovative use of media’ and ‘political economy analysis’ as some of the most salient challenges to resolve as CSOs take anti-corruption work to the next level. 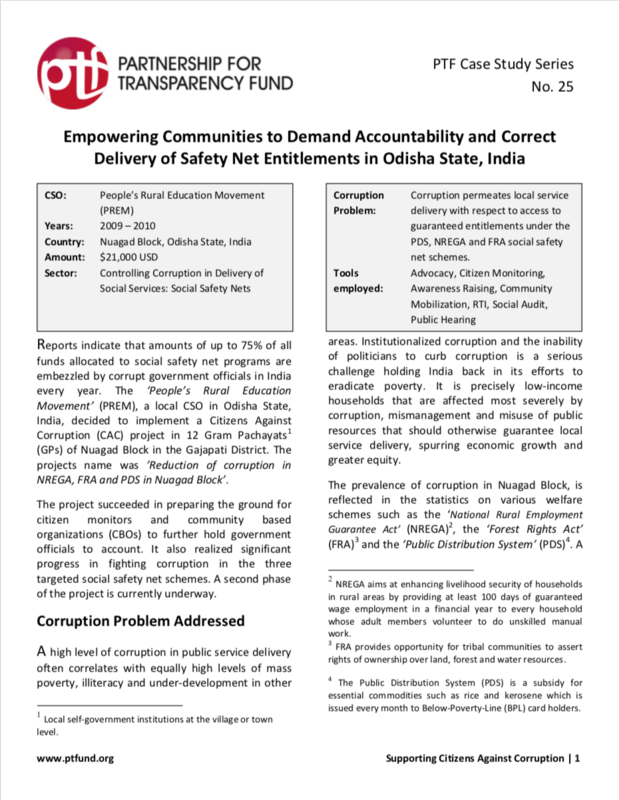 This report analyzes projects pursued by 14 civil society organizations (CSOs) working in four diverse Indian states in India (Odisha, Karnataka, Rajasthan and Uttarkhand) and covering more than 1000 villages. 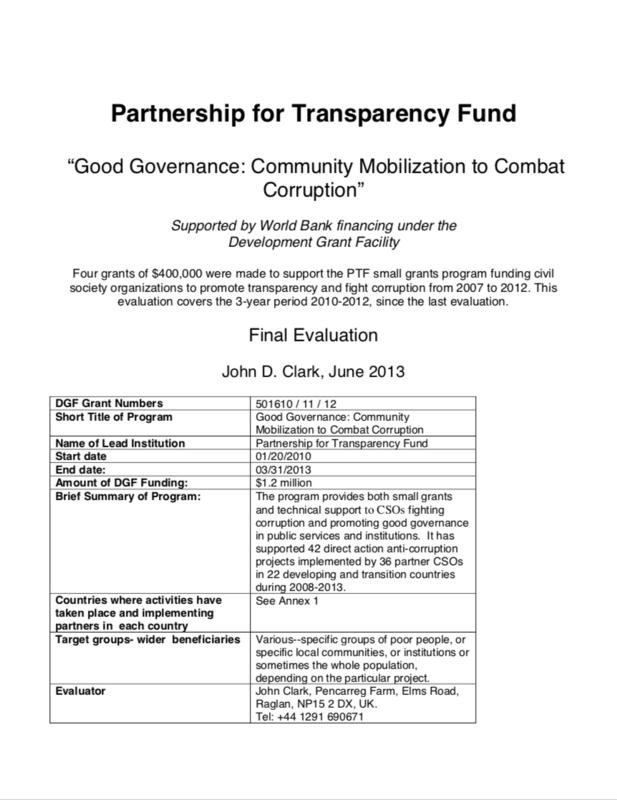 INDEPENDENT EVALUATION Evaluation of "Good Governance: Community Mobilization to Combat Corruption" Program DOWNLOAD EVALUATION John Clark, an international development consultant, former civil society activist and adviser to former UN Secretary-General Kofi Annan, was commissioned by the UK’s Department for International Development (DFID), and by the World Bank to evaluate PTF supported projects supported by our “Citizens Against Corruption” and “Good Governance: Community Mobilization to Combat Corruption” programs. 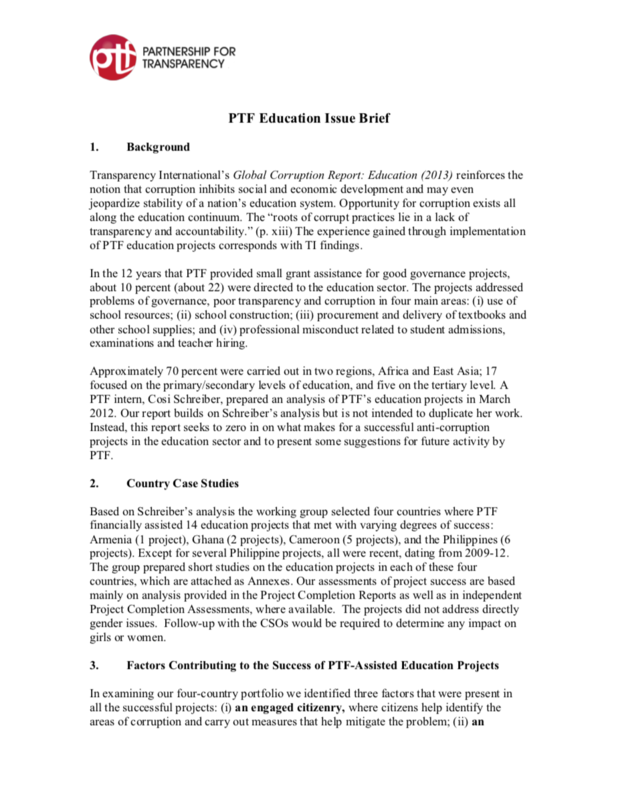 PTF projects are assessed in terms of their effectiveness and impact, their sustainability, their replicability, their innovative approaches, and whether they truly represented value for money. 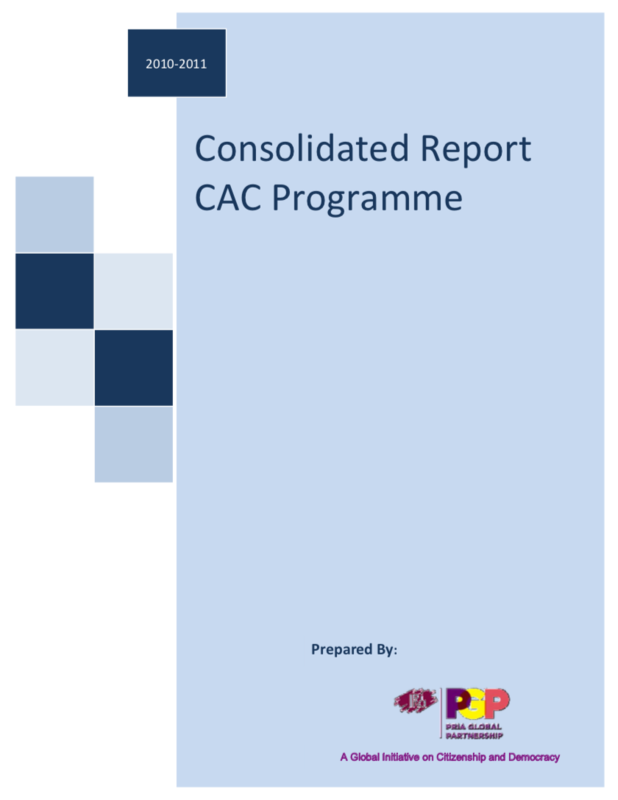 In each area the reports find substantial accomplishments. 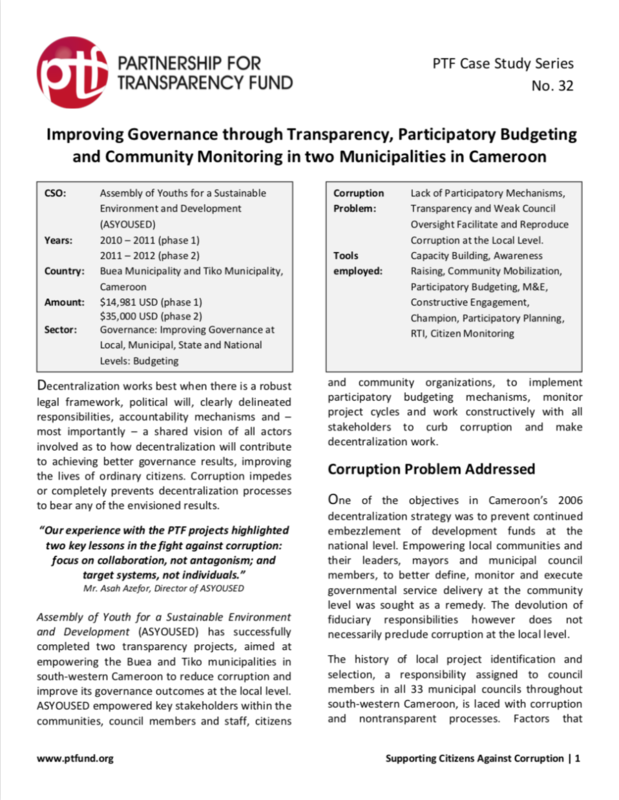 This Case Study Reviews a project implemented by the Partnership & Teaching NGO (P&T) which succeeded in testing, documenting and streamlining the process of extra-budgetary fund collection through stakeholder involvement and better governance procedures and was highly successful in advocating for national adoption of better policies. 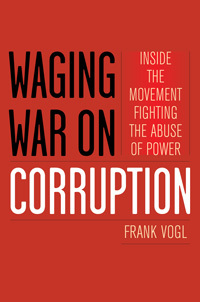 In Waging War on Corruption: Inside the Movement Fighting the Abuse of Power, Frank Vogl (PTF Vice-Chair), one of the leaders of the worldwide anti-corruption movement, shares a history filled with stories of heroes and victims of corruption. 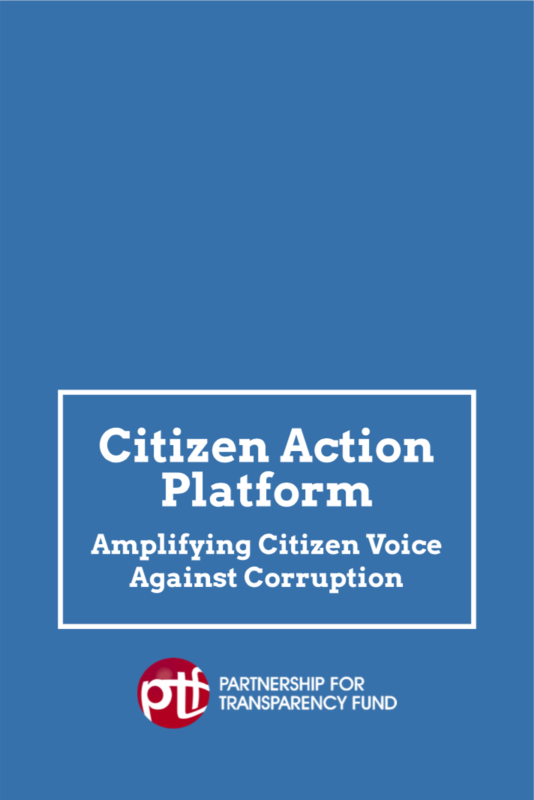 He chronicles the successful campaigns by enormously courageous civil society activists, journalists, and public prosecutors and explains the crucial challenges that now must be confronted. 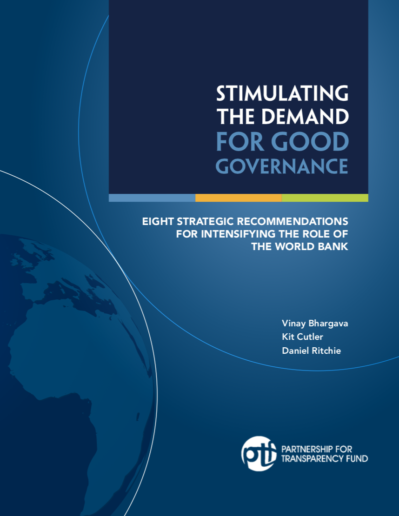 At stake is nothing less than our global security, the reduction of poverty, the stability of our economic and financial systems, and the cause of freedom and democracy. 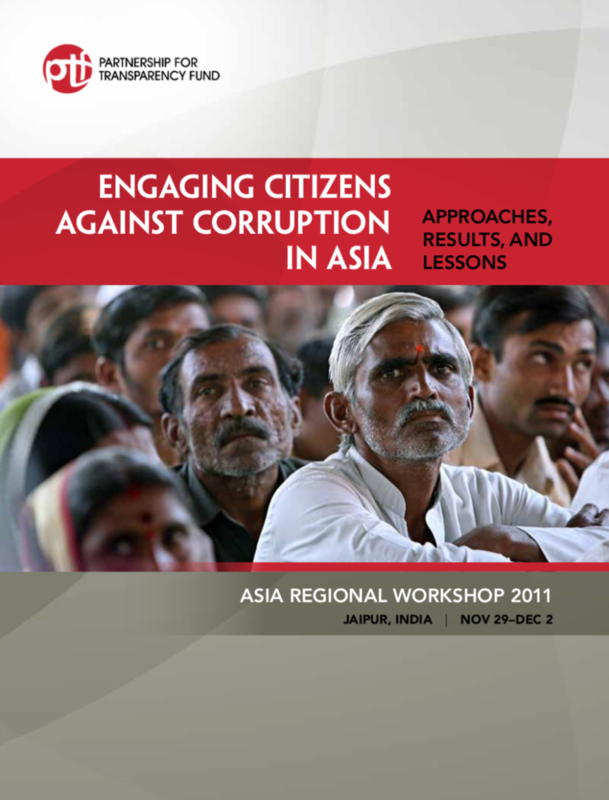 The media—traditional mass media as well as new technologies—can play a vital role in unveiling corruption, framing corruption as public problem, suggesting solutions, and generally empower citizens to fight corruption. 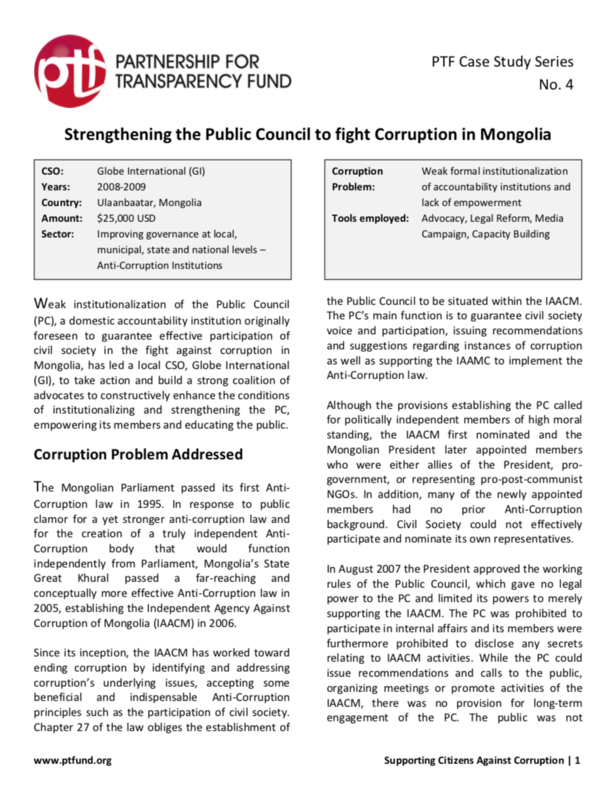 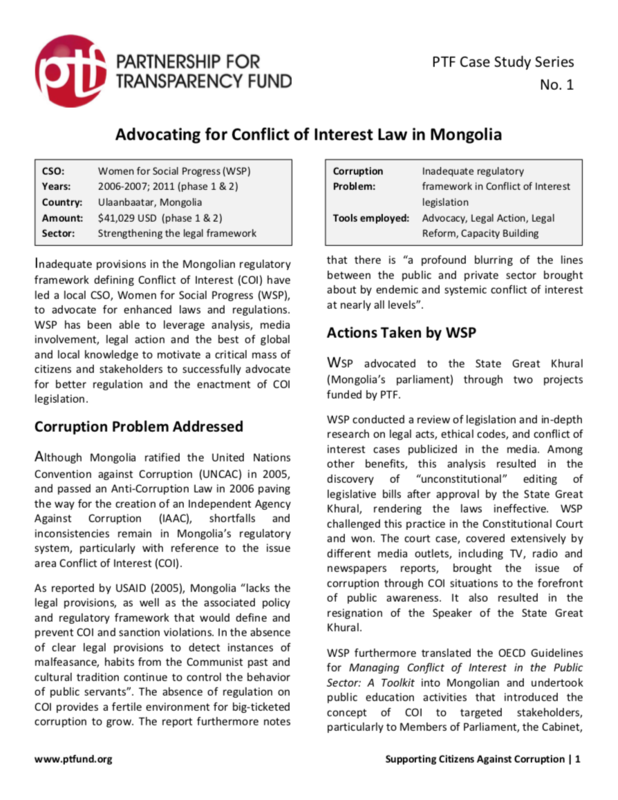 This paper provides an overview of the basic principles of media effects and presents specific techniques involving the media in the fight against corruption. 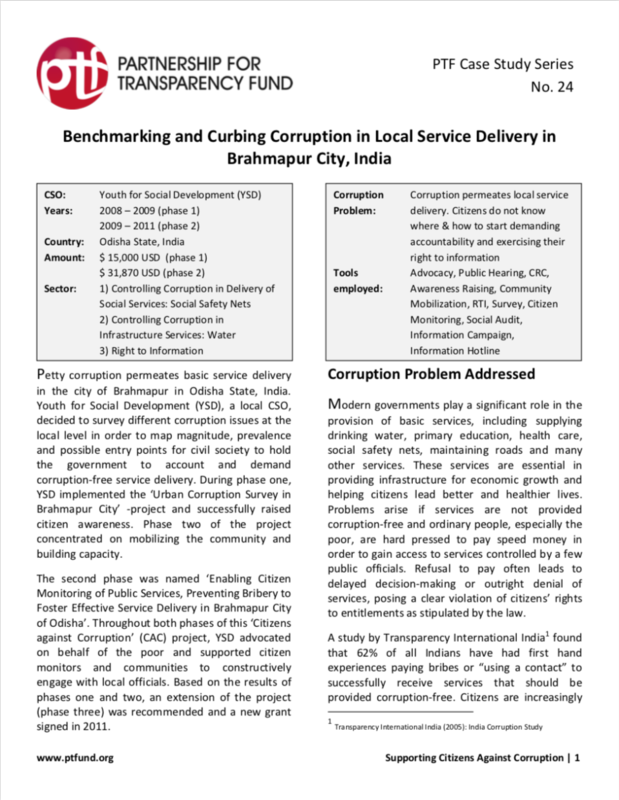 This Case Study reviews a project implemented by Youth for Social Development (YSD) to survey different corruption issues at the local level in order to map magnitude, prevalence and possible entry points for civil society to hold the government to account and demand corruption-free service delivery. 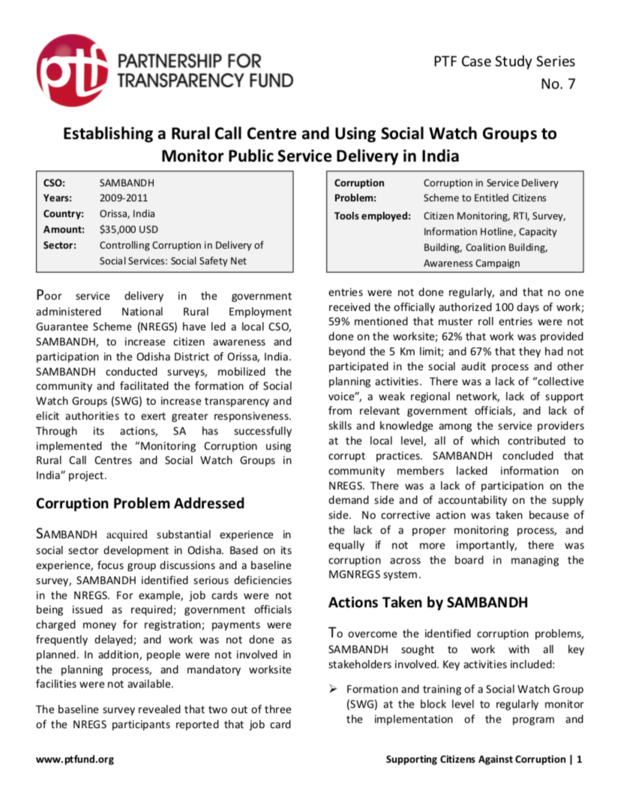 YSD also advocated on behalf of the poor and supported citizen monitors and communities to constructively engage with local officials. 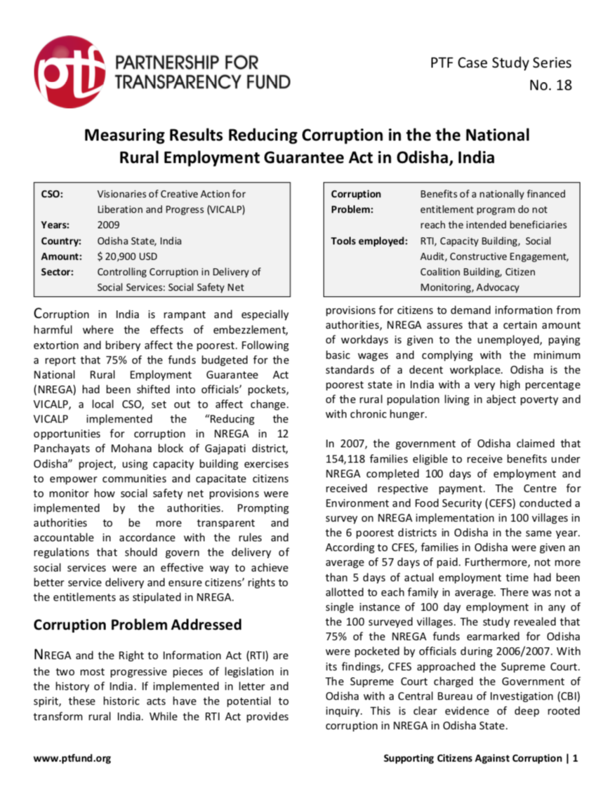 This Case Study analyzes a project implemented by the ‘People’s Rural Education Movement’ (PREM), a local CSO in Odisha State, India, that sought to reduce corruption in three social safety net programs: the National Rural Employment Guarantee Act, the Forest Rights Act and the Public Distribution System (food security). 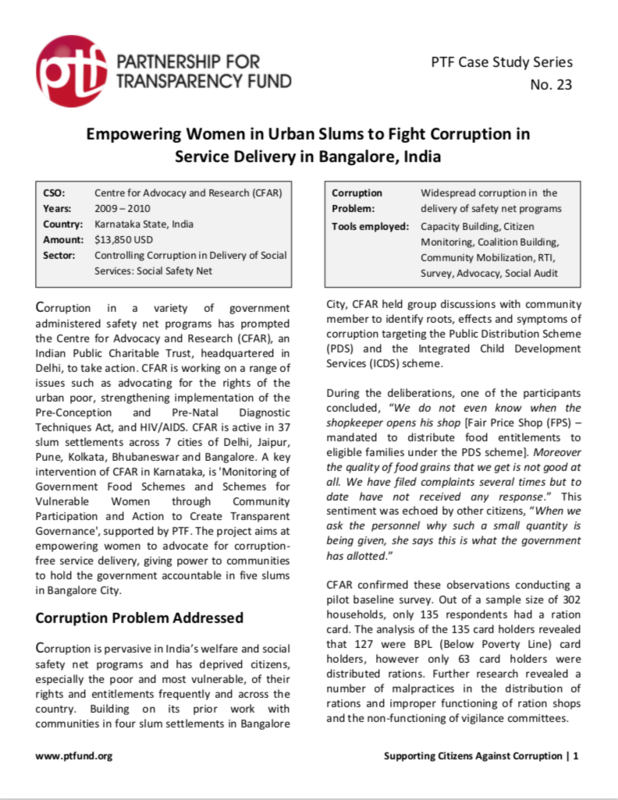 This Case Study reviews a project implemented by the Centre for Advocacy and Research (CFAR), aimed at empowering women to advocate for corruption-free service delivery, giving power to communities to hold the government accountable in five slums in Bangalore City. 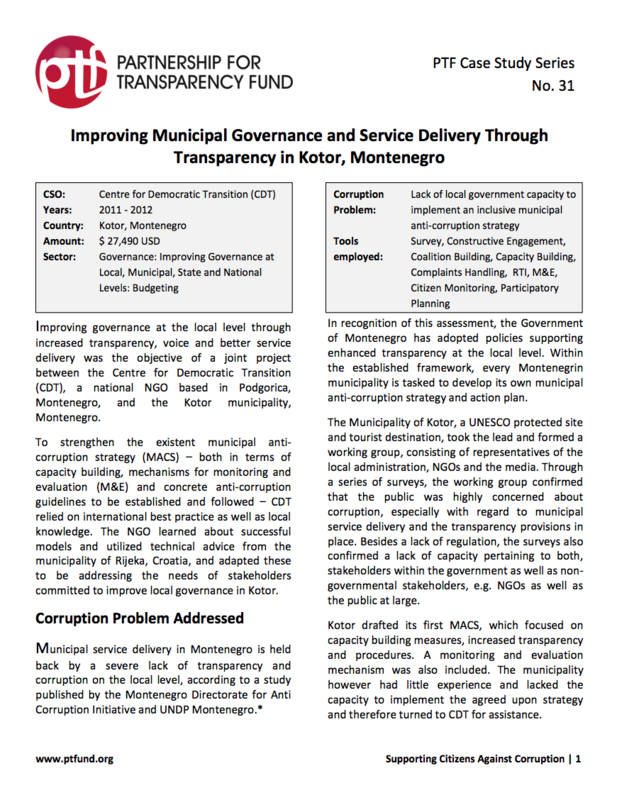 This paper provides readers with the basic idea of how demand for good governance (DFGG) strategies, in particular social accountability (SA) strategies, can be employed to help citizens demand greater authority responsiveness and thereby enhance their living conditions. 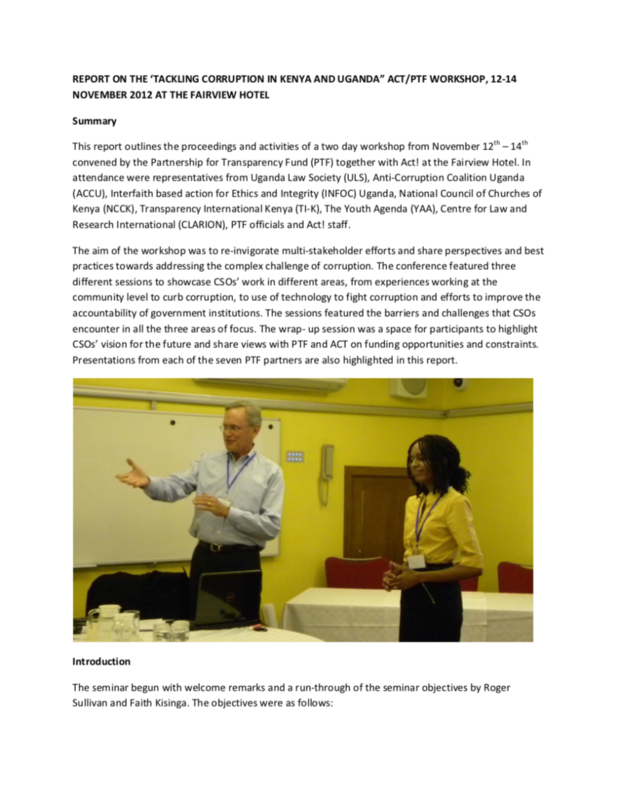 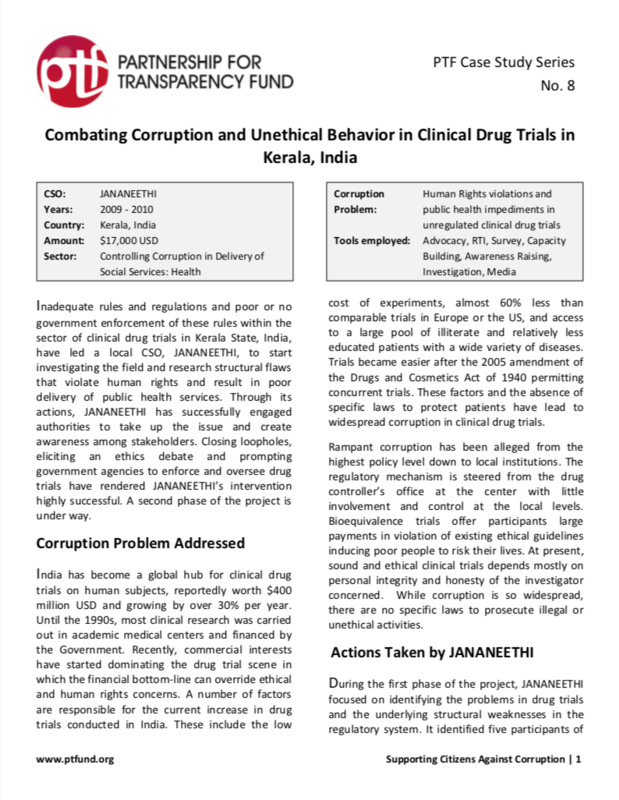 This paper introduces an analytical framework to consider the overall environment and strategic parameters that underlie a specific instance of corruption so as to logically and specifically tailor their project towards achieving the best impact possible. 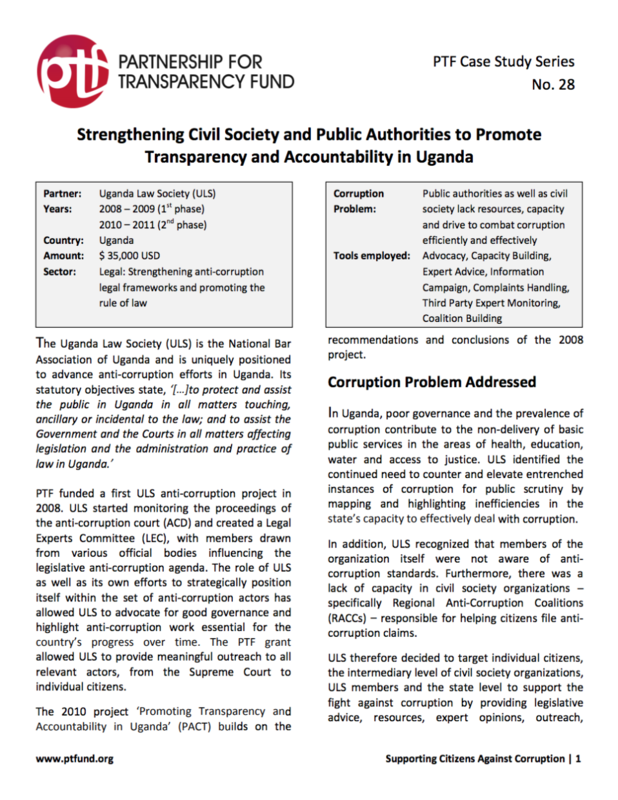 CSOs often struggle to balance their vision and declared goals with the necessary financial security to carry out activities as needed over a prolonged period of time. 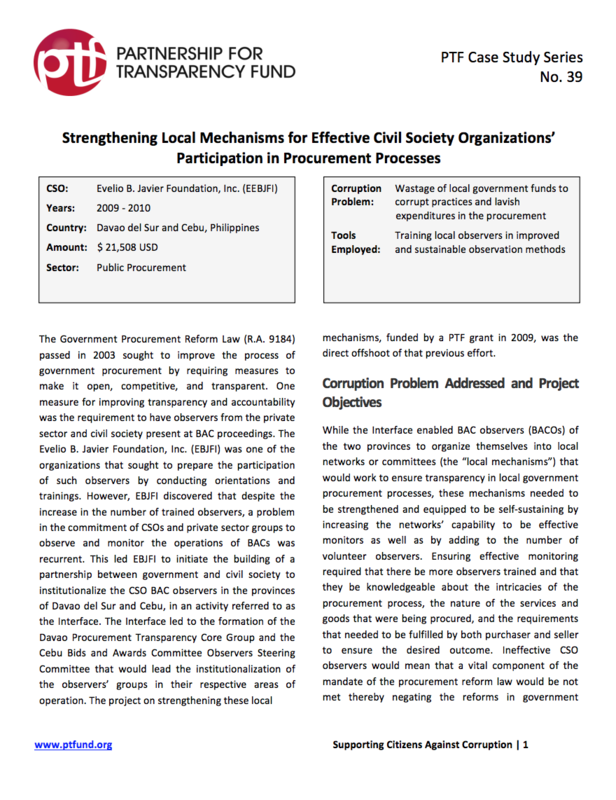 This paper provides a checklist for CSOs to self-evaluate their actions, aspirations and assumptions against common problems encountered and offers entry points to think about sustainability. 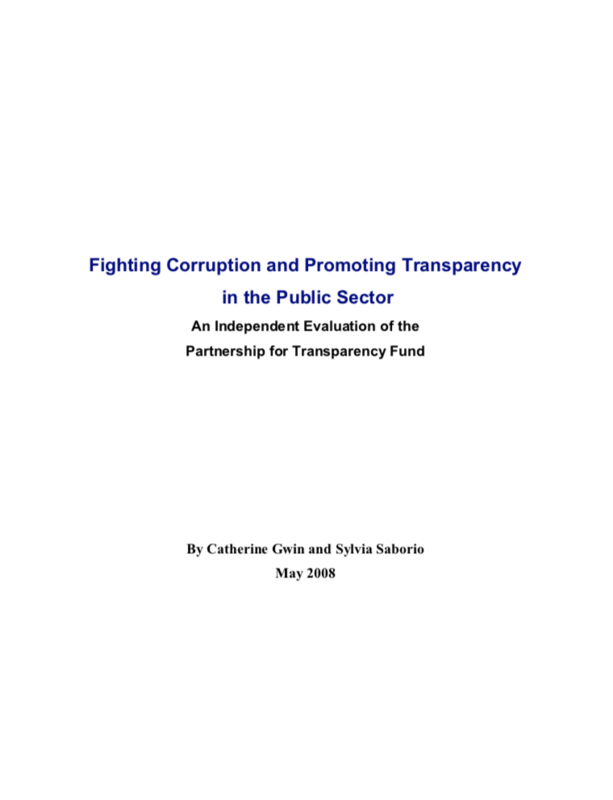 This report prepared at the request of UNDP by Alexander Shakow suggests that PTF is an extremely valuable and effective instrument for support of small but important anti-corruption projects.